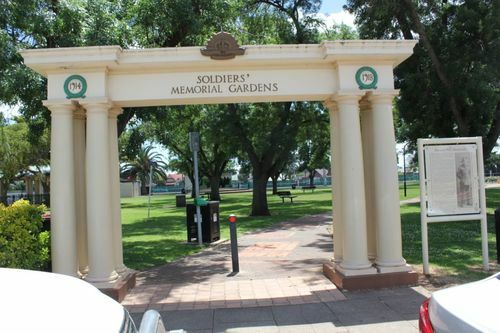 A big area of land near the Prospect Oval--formerly used as a parking ground for motor cars-has been transformed by the Prospect City Council within a few months into a picturesque memorial gardens. The reserve, at the entrance of which is a memorial arch, has been constructed to commemorate the valor of Prospect's fallen war heroes. At the last meeting of the council it was decided that the Governor (Sir Winston Dugan) should be invited to perform the official opening of the gardens on April 26. Lawns, flower beds, and neatly graded paths have made the new gardens an impressive sight. News (Adelaide), 20 February 1926. THESE GARDENS WERE OPENED BY HIS EXCELLENCY THE GOVERNOR SIR WINSTON JOSEPH DUGAN K.C.M.G. D.S.O.